Of these charges, it is the third that really gets to the substantive differences between us. My use of page — and reference — counts in the review was simply a convenient shorthand, of the sort that is necessary in short essays, to give readers a quick sense of what a book under review does, and does not emphasize. Of course, historians can often ‘transmit an impressive amount of information and analysis’ in a small number of pages, as Palen says, but the overall allocation of space still has more than a little to tell us. The fact that A World Connecting allocated just three sentences (out of 1,168 pages) to the First and Second Socialist Internationales suggests pretty strongly, however crude the measurement, that the authors did not consider the Internationales an important subject. As for the conflation of Atlantic history and global history, it is worth recalling Palen’s own admission that ‘”global history” has been so […] under-defined that […] it is fast running the risk of becoming meaningless.’ In practice, the boundaries are not easy to draw. Take the example I alluded to in the essay, the Haitian Revolution. In one sense, it was an ‘Atlantic’ event par excellence, rather than one best related to ‘the theme of globalization’ that Palen sees as the essence of global history. But as recent work has made all the more clear, to understand the Haitian Revolution, we first need to understand the breakneck expansion of France’s Saint-Domingue colony in the 1780’s. 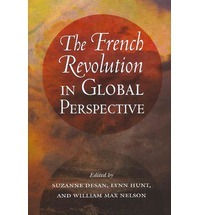 And this expansion in turn needs to be understood as part of a pattern of global economic change, including not just the Atlantic triangle trade, but also the circulation of Latin American silver, and the activities of France’s recently rechartered East India Company (see, for instance, the essays in Suzanne Desan, Lynn Hunt, and William Max Nelson, The French Revolution in Global Perspective, Cornell University Press, 2013). The more important issue Palen raises, to my mind, is whether I was demanding the ‘impossible’ of the contributors to A World Connecting, and whether I expected ‘a comprehensive global historical study of the period 1870-1945.’ While the book’s subtitle, ‘A History of the World’, is ambiguous, to say the least, about whether ‘comprehensive’ coverage is being promised, I did not in fact criticize the authors for failing to provide it. I recognized quite explicitly that they were writing a history of global connections — I just faulted them for the way they were doing it, and the sorts of connections they did, and did not, emphasize. Tellingly, Palen doesn’t really dispute the importance of the connections whose absence I underlined, including especially intellectual, ideological, cultural and military ones. He argues, rather, that the authors deserve praise for what they did accomplish, and that, essentially, they couldn’t have been expected to do everything. I don’t entirely disagree with Palen on this score. In fact, I praised the authors, quite lavishly in places, for the things they accomplished (‘splendid…’, ‘virtuoso…’, ‘a remarkable body of insights…’ – more than enough material here for publicists to excerpt in an ad). But this was not a volume of miscellaneous conference papers, of the sort that shoots out ideas haphazardly, like fire arrows in the darkness. By its title, by its inclusion in a high-level series published in both English and German, by the exceptional prestige of its authors, and, yes, by its sheer number of pages, this was a book designed to evoke the words ‘magisterial synthesis’. And in a magisterial synthesis, questions of balance, of emphasis, and of inclusion are crucial. It is important not just to highlight the results of new research, but to connect them with subjects of more long-standing historical attention. This is, above all, what the volume failed to do. 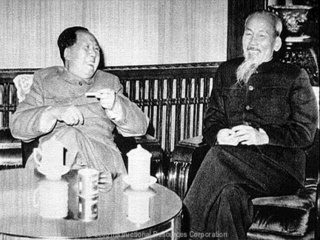 Mao Zedong meeting with Ho Chi Minh, 1958.
from the West. To take the example of socialism, again, an absolutely fascinating contribution could have been written on the way that socialist leaders around the world (Ho Chi Minh and Mao Zedong come most obviously to mind) appropriated and transformed socialist ideas for their own purposes. But in a book on global connections in the period 1870-1945, I don’t think that the neglect of these ideological connections can be justified. I don’t think it would have been ‘impossible’ to bring in the subjects I criticized the authors for neglecting. Indeed, in the volume itself, Charles Maier’s book-length essay goes a long way towards including them within the particular compass of his own subject, the state (and I praised him for doing so). The authors’ broad methodological framework could have incorporated many of the subjects I suggested needed to be addressed. I don’t think the volume needed to be massively increased in size. But I do think it needed to be conceived and organized in a somewhat different fashion. But beyond the particular problems with A World Connecting, I remain skeptical about what the ‘global turn’ in historical studies can still accomplish. Even Palen, I note, doesn’t really disagree with my points about how difficult it is to write this sort of history in an accessible and engaging manner. He just thinks the ‘sacrifice’ is worth it, for the goal of achieving a more complete, complex and nuanced overall story. Perhaps. I would like to believe Erez Manela, when he talks, in the passage Palen concludes with, about the ‘boundless new avenues for historical enquiry’ that the global turn has opened up, especially given the obvious relevance of such enquiries to problems of global politics and political economy today. My sense, however, is that this particular ‘turn’ has reached a point of diminishing returns, thanks to the difficulties involved in doing global history in a comprehensive, forceful and accessible manner. Historians in the field have certainly done a great deal of hugely important work, which Palen rightly calls attention to. But the profession’s energies might now be more usefully engaged elsewhere. Next Is Doctor Who an Anti-Imperialist?